The park’s great variety of habitats supports the survival of over 600 bird species which cannot be found anywhere in East African national parks. 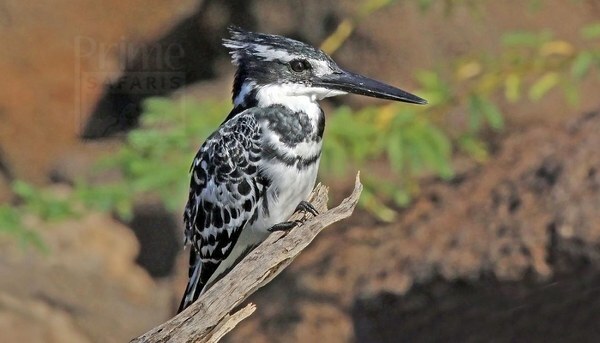 The park’s confluence of savanna and forest, linking to the expansive forests of the DR Congo gives an opportunity to spot/view the East and Central African bird species. 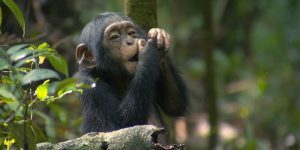 Chimpanzee Trekking in Kyambura Gorge; Kyambura Gorge is perfectly located on the eastern side of Queen Elizabeth National Park, it covers a distance of about 16km and at its deepest it is 100m deep. The Kyambura River is responsible for creating the magnificent steep Kyambura Gorge. 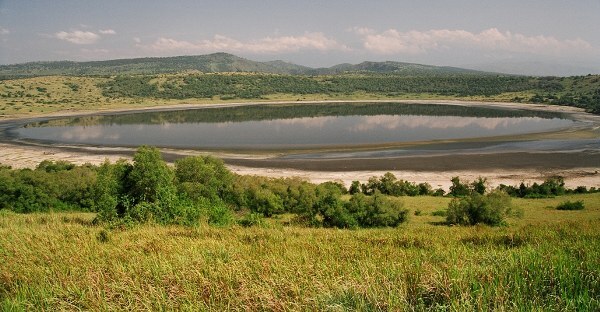 The gorge emerges from between savannah grassland and has a riverine virgin forest that transits to papyrus swamps towards Kazinga Channel. Kyambura Gorge is home to habituated chimpanzees, many other primates and a huge variety of both forest and plains bird species. The best time to trek the chimpanzees is in the morning, trekking is also available in the afternoon but this time slot may be more undesirable due to the likelihood of increased temperatures. Trekking chimpanzees at Kyambura Gorge is considered to be slightly harder than at Kibale Forest National Park. The trails are maintained and once inside the Gorge the inclinations are relatively easy going, however, the climb back out of the Gorge can be extremely difficult if you are not prepared. The park is served with all types of accommodation ranging from luxury lodges that will favors luxury visitors, Mid-range lodges for standard travellers and budget lodge for basic/ budget travelers. The following are some of the many lodges found in the park. Mweya Safari Lodge provides visitors to the lodge a wonderful experience of luxury stay in the typical African wilderness areas of Queen Elizabeth National park. Mweya Safari Lodge has thirty two ( 32) Standard Rooms and 12 Deluxe Rooms, 2 Suites all connected with Air-conditioners. 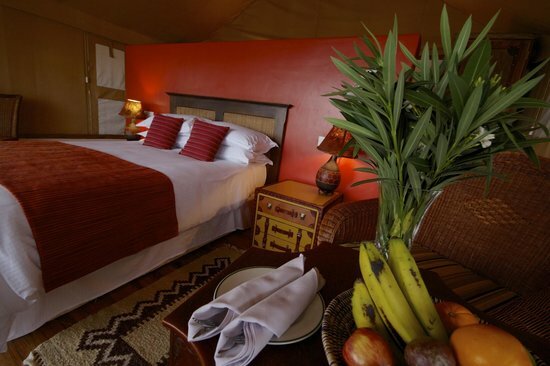 For guest interested in staying or sleeping in the cottages, they are offered an opportunity to chance to the luxurious Presidential Cottages, Queens Cottages, two family cottages and Luxury tents as well as the two standard tents. All the rooms at Mweya Safari Lodge offer a spectacular view of the picturesque Kazinga channel and the forest hogs odd curious hippo, roaming on the grassland vegetation of Queen Elizabeth National park. In regard to dinning, the restaurants in the lodge serves high quality as well as range of exquisite Continental, Indian and international Cuisinnes. The Mweya Health Club and spa provides treatments to refresh you a long day out in the game park. With an abundance of game, and some of the best bird watching in Africa, Mweya Safari Lodge is the perfect place to start your journey of discovery. 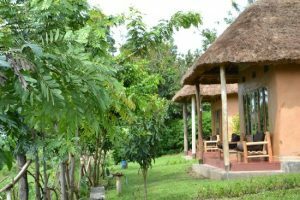 Kyambura Game Lodge is an eco-lodge located on the eastern corner of Queen Elizabeth National Park, in the western part of the great East African Rift valley. 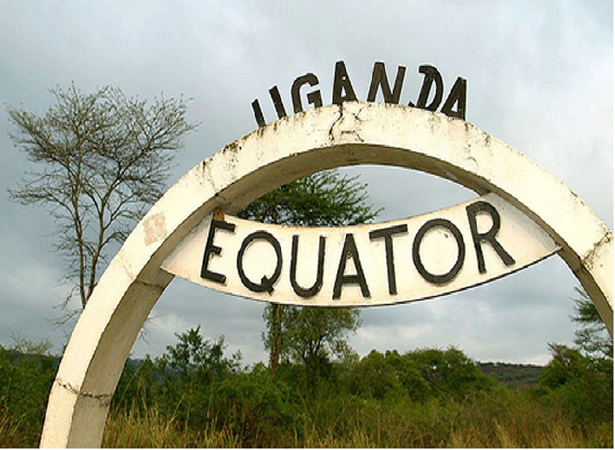 The place has spectacular or wonderful views over the national park and the famous Rwenzori Mountains. Accommodation services in the lodge are offered in the seven (7) capacious and tastefully designed self-contained grass-thatched cottages, connected with features/ amenities like bath tabs/showers, running hot and cold water, with 220v electricity and a private wooden balcony perched over Queen Elizabeth wildlife Park. The restaurant and the lounge/bar/fireplace are located next to sundowner deck overlooking the spectacular National park grounds for relaxation in the evenings while summarizing up the day’s activities. The kitchen prepares local as well as international cuisine and different -course meals are mostly prepared with organic vegetables from the lodge’s own garden and served by lodges friendly and professionally waiters and waitresses. 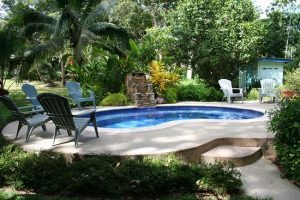 As far as relaxation and refreshment places are concern, the lodge has a swimming pool where guests can experience swimming activities at any time they fell like. Privates’ balcony is available in each and every room for visitors to catch the wonderful view of the surrounding green grounds of the lodge. 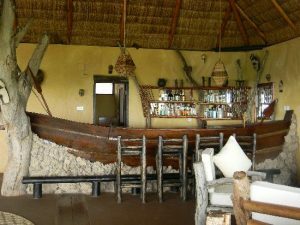 The Bush Lodge forms an excellent base for your safari activities in Queen Elizabeth National Park. The lodge is built along ecological principals, the bandas designed and spaced in such a way to maximize privacy and enhance the safari aspect of the lodge. Surrounded by the National Park and bordering the Kazinga channel, the lodge has a truly unique setting. Animals’ literary room in and out the camp and sounds of hippo’s and hyenas complement the lodge’s star lit dinners. 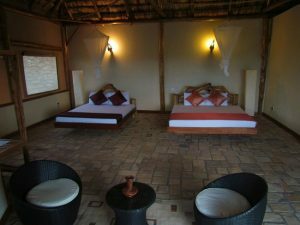 Queen Elizabeth Bush Lodge has six ( 6) self-contained units which are capaciously placed between the indigenous bushes. Built according to ecological principals, the accommodation combines seamlessly with the surrounding landscape. The rooms are stilted buildings on wooden platforms and are made from a fine combination of canvas and local materials. Huge windows allow visitors to fully absorb the environment and to feel one with nature. Room amenities include Private en-suite bathroom, Eco-toilet and outside shower where 2 showerheads allow couples to take their starlit shower together. Dining is given great consideration at the Lodge .The lodge’s excellent cuisine is matched by an impeccable service. The restaurant is a safari inspired concept of an open tent which is lit with romantic light transforms and hence making it changing it to charming setting to end a perfect day. Jacana Safari Lodge is an intimate, Mid-range eco-lodge conveniently set on the edge of a crater lake in Uganda’s Queen Elizabeth National Park. The Lodge has seven luxury chalets established from natural local materials, in conformity to its forest setting. 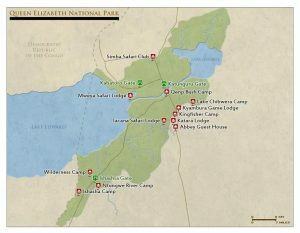 Each spacious chalet is privately decorated and has features like a proper running shower, flushing toilets and a superb enclosed verandah with large windows, providing panoramic views over the Nyamusingiri Crater Lake. 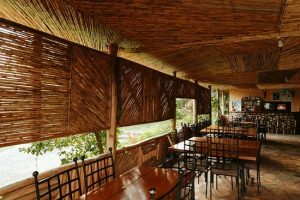 The Restaurant at the lodge serves both international and local foods and the food served is prepared by experienced chef. The lodge also has lodge identified as the great Virunga Lounge. Activities at Jacana Safari Lodge include forest/crater and bird watching walks, gondola and lake canoeing, game drives, bat cave visits, sundowner cruises, chimpanzee viewing, fishing and cultural village visits. 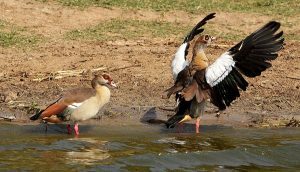 Jacana Safari Lodge provides a naturalist environment so that you can explore your surroundings on foot and take advantage of the outstanding bird- and butterfly-watching opportunities. Alternatively, you might prefer to hike into one of the spectacular gorges. You can enjoy the lake on one of the canoes or small pontoons, and the lodge will provide rod, tackle and bait for those who wish to go fishing. The captivating Enganzi Game Lodge is nestled on a hill bordering the Queen Elizabeth National Park and overlooking untouched bush in the cradle of western Ugandans magnificent wild. The lodge has five (5) splendidly set cottages which offer a picture perfect view of the Queen Elizabeth National Parks bush expense. The lodge also has single, double and deluxe suite rooms where guest are allowed to make choice of which room to spend night from. The lodge offers unmatched views especially in the well –designed open-sided Main and you can also enjoy sundowners or a 3 course dinner in the dining room or upper deck enjoying the beauty that Africa has to offer. The activities offered at the lodge include nature walks, Game viewing, bird watching, Community, village and crater walks and the perfect location of the lodge provides a breathtaking advantage for sightseeing. Staying at Enganzi Game Lodge means that your experience will be crowned with an unforgettable imprint of sheer luxury in natures wild. Pumba Safari Cottages is great Lodging facility for all budgets travellers on Uganda Safaris. The lodge is located in Kyambura area overlooking Queen Elizabeth National Park. 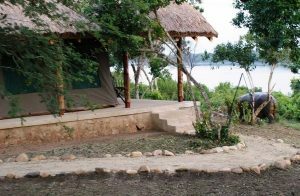 Pumba Safari Cottages offers accommodation services in its three cozy ( 3) Cottages & one (1)Safari tents. Each cottage has two comfortable beds and a bathroom with shower. The cottages also offer magnificent views over Queen Elizabeth national park from the windows. The Tent in the lodge also provides picturesque view over Queen Elizabeth national park from the veranda. The tent is furnished with comfortable twin beds and has a bathroom with a shower. The lodge has a restaurant that serves breakfast, lunch and dinner. If you wish to have a packed lunch for your adventures on the Savannah it can be arranged. Simba Safari Camp is a budget safari accommodation situated on the border of Queen Elizabeth National Park. Here you will find a variety of comfortable and affordable guest rooms, dormitory rooms and a well-established campsite with safari tents or space to pitch your own. Perched on a hill, the camp offers spectacular views of Lake George, Lake Kikorongo and the classic African savannah plains stretching to the distant horizon. It is the closest accommodation for game drives in the Kasenyi plains, and elephants and buffalo can even be viewed from the camp. Delicious meals are served at lodge’s open air restaurant, to give you a taste of real African cuisine. Guests can also choose a wake-up call with fresh tea or coffee served on their verandas. 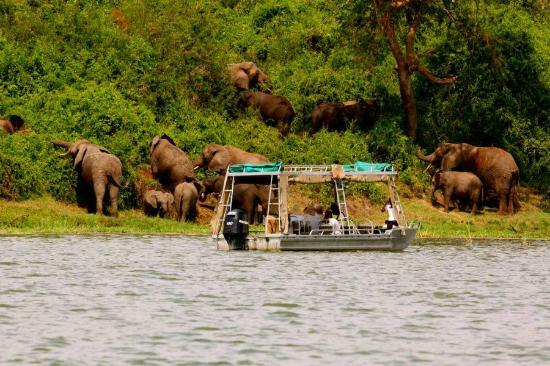 Whether you wish to go on a game drive, join a boat safari on the Kazinga Channel or go in search of the chimpanzees in Kyambura Gorge, Simba Safari Camp is the perfect base for your adventure! Lodge Amenities include; Restaurant and bar, Lounge with DSTV, Solar power, On-site wildlife view in, the camp has 4WD safari vehicle which can be hired for game drives or transfers to the Park Simba Safari Camp offers eight twin rooms and one triple room. All have ensuite bathrooms with flushing toilets and solar heated water. Private verandas are ideal spots to relax. The family cottage sleeps up to five, with two bedrooms and an additional bed in the lounge. The four dormitory rooms each have five or six bunk beds with mosquito nets and shared showers and toilet blocks. 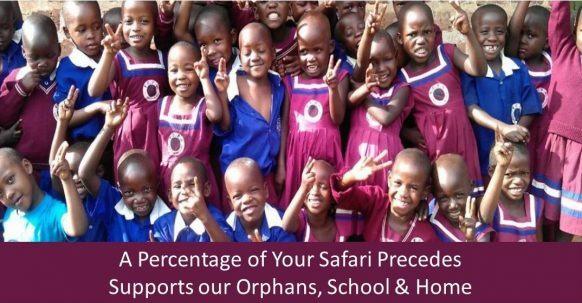 Activities at the Lodge, Cultural performances by Kikorongo Women’s Group, Day trips to Katwe Salt Lake and village, Game drives in the Kasenyi Plains and Mweya Peninsula, Kazinga Channel boat safari, Chimp tracking at Kyambura Wildlife Reserve and Exploration of the crater lakes. Responsible Travel Most staff is from local communities, and much of our fresh fruits and vegetables are purchased from their gardens. We host cultural performances and craft workshops at the Camp by Kikorongo Women’s Community. We have solar-powered lighting and solar hot water. The rates charged by the camp site are showed below. The outstanding national park was named after Queen Elizabeth II and later renamed Ruwenzori before it returned to its royal name. It’s very popular for its volcanic features, comprising volcanic cones and deep craters, many with crater lakes such as Lake Katwe where salt is mined. The national park consists of Maramagambo Forest and neighbors Kigezi and Kyambura Game Reserves, Kibale National Park plus the Virunga National Park in the Democratic Republic of Congo (DRC) and Kasese lying on its north-western wing. 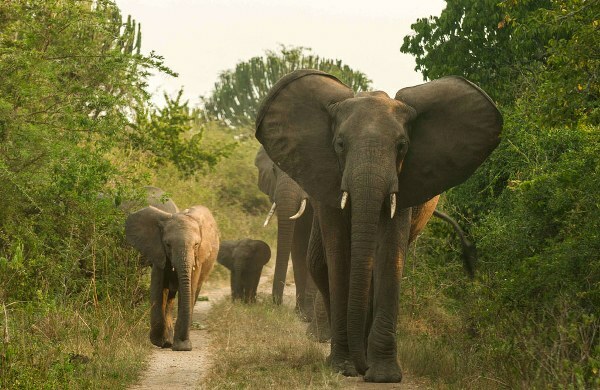 Queen Elizabeth National Park is undeniably Uganda’s most famous tourist destination. The park’s diverse ecosystems, which include sprawling savanna, shady, humid forests, sparkling lakes and fertile wetlands, make it the ideal habitat for classic big game, ten primate species including chimpanzees and over 600 species of birds. The bird species include the black bee-eater, 11 types of king fisher, Shoebill storks and several species of falcons, eagles and other raptors. Conveniently set against the backdrop of the jagged Rwenzori Mountains, the park’s fascinating vistas include dozens of enormous craters carved dramatically into rolling green hills, panoramic views of the Kazinga Channel with its banks lined with hippos, buffalo and elephants, and the endless Ishasha plains, whose fig trees hide lions ready to pounce on herds of unsuspecting Uganda kob.